more tofu please: I like your bundt. Many of you follow theppk on facebook, so this is old news for you. 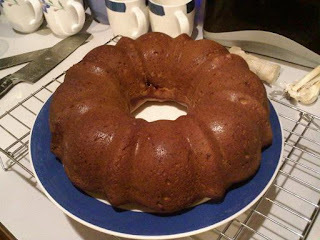 For those of you who haven't tasted this fabulous bundt cake, I command you to add theppk on facebook and make the Triple Apple Cider Bundt Cake. Obviously, Isa's pictures are way better than my cell phone picture of the cake straight out of the oven (no frosting on it, as you can see in the photo. Here it is, sorta a proof of baking thing. I made this cake for a co-worker's birthday. It was gone in about four hours. It goes well with coffee, tea, or a glass of soymilk (or whatever milk you prefer, I'm sure). My boss and co-workers give this cake 5 stars! And coming from all omnis, that's really awesome. I ended up making 2 cups of the apple filling (...accidentally? I love apple pie, so probably not an accident). I ended up plopping some of that deliciousness onto toast - amazing! I've been eying the Triple Apple Cider Bundt Cake but still have not tried the recipe, despite the good things I've heard about this cake. Glad to hear of the impressive omni approval rating! Oh yum, I definitely need to make this. Yay! I found your blog. I figured you had one after sitting next to you at Matsu Sushi, but I did not ask like a fool. That does look tasty but for me this weekend is going to be spent testing out vegan pumpkin pie recipes. My brother loved my vegan apple pie so much that he asked for a pumpkin pie for Thanksgiving. William - I have a LJ account that I use so much more frequently, but it is super personal. This blog is still pretty new! Good luck with the pumpkin pie recipe testing! Tiffany and vegan.in.brighton - This is incredible! Definitely use Honeycrisp Apples if you can; I think they make all the difference. Hi, my name is Jen and welcome to this blog. I love all things related to traveling, food, and music. Follow along to as my husband, El, and I wonder around and experience new things. Sharing the love of tofu with non-vegans!